I'm having one of those bad weeks were it just seems like I can't eat anything without my disgestive system throwing a strop! Going back to what I was saying in my earlier post about coffee sensitivity, I've started to look into acidic and alkaline foods. There's loads of info online about it. I read that you need a 50/50 balance of both foods. According to most of the lists I've seen, my diet is pretty much all acid (even though I avoid wheat.) I definitely think there's something in this and i'll be cutting back on acidic foods for sure. Their excellent listings page details the arrival time of particular gluten free items in shops and they now include an unbiased review of each item. Their detailed UK-centric website is also a great source of information on most other 'free from' foods and contains articles on research and recent developments in 'free from'. Oriental Supermarkets - The Wheat Free Girl's Best Friend! One thing I love about London is that a lunch time wander sometimes ends up in an exciting discovery! I picked up some wheat free instant noodles (35p) and a packet of Vietnamese rice papers (£1.70). 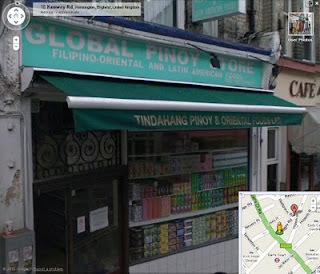 I normally get my wheat free instant noodles in Camden at the Taste of Siam Supermarket. However I'm rarely in Camden so it was great to find somewhere close to work. As for the rice paper, I had been dying to try making my own Vietnamese spring rolls. Me and my husband had a go on the weekend and it was very messy but a lovely way to spend a Saturday night. I'll do another blog about that on another day! I've always had a problem with coffee - in recent years, Ive put it down to an intolerance, added to the ever increasing list if foods my stomach is sensitive to. I recently mentioned to someone that I seem to have more of a problem with instant coffee than with freshly brewed coffee. They suggested that it might have something to do with the acid in the coffee. I guess I'd never thought of coffee being acidic before. (Now that's got me thinking about all the other acidic things I should probably avoid!) 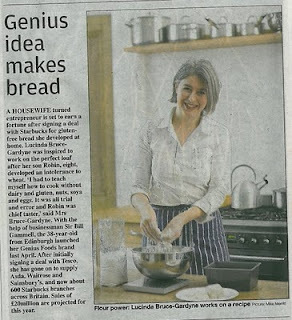 Anyway, there was a piece in the paper this morning that seemed to prove my theory. The scientists at the University of Vienna say that they have found the components that cause heartburn and stomach pain in coffee. Ooh look what was in the Metro this morning! 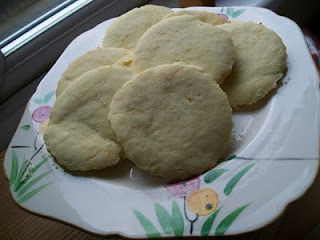 I found a lovely little recipe in Phil Vickery’s Gluten Free cookbook on the weekend for shortbread. I was in Waterstones at the time and quite poor so I did a very naughty thing and memorized the recipe! I may have improvised certain parts of it, but they came out brilliantly. My husband remarked that the texture was fantastic and my colleagues loved the taste. The addition of fruit puts this recipe above the rest it seems. Looks like I’ll have to make a purchase if all the recipes are that good! You know when you find one of those places to eat that is just so great, yet easy to get to and, well, small that you're tempted not to recommend it to anyone? Well Barrafina in Soho is one of those places. It's perfect for those who like lots of small dishes, fresh, strong flavours and for anyone avoiding wheat or gluten. I must have passed it a hundred times. The decor is subtle, as is the sign on the door. It's tiny. You eat at the bar and you have to wait a fair while to get a seat. But it's worth it for the fabulous tapas dishes. Each one is like a taste explosion. Just a few ingredients and pow! They really know what they're doing. The intimate setting at the bar was surprisingly enjoyable too. It was good to see the food being cooked and prepared, I found it added to the excitement. The specials change all the time and are explained to you as you sit down. This is a great recipe for a simple yet delicious chocolate cake. If you put the mixture into a square tin, you could slice it up and it would pass as a very acceptable brownie, or you could even make two round ones and turn them into a Victoria sponge cake. I guess what I'm trying to say is, this isn't really a sponge recipe nor a brownie one, it's somewhere in between but yummy none the less! 1. Grease and line a 18 x 28cm / 7 x 11 shallow baking pan with greased greaseproof paper or non stick baking parchment. Wheat free seeded rye bread, free range egg mayonnaise (37%) and mustard cress (6%) and very lovely it was too. Well they've always said that they'll start stocking Gluten Free sandwiches when a suitable bread came onto the market and they've come through on their promise. Starbucks "NEW! Wheat and Gluten Free Tuna Sandwich Pole and line-caught Skipjack tuna with roasted tomatoes and basil mayo, topped with rocket leaves served on Genius gluten free™ bread." I just walked about a mile to my nearest Starbucks on my lunchbreak. Couldn't see them, asked the lady behind the counter, explained in lots more detail what I meant while being met with a dumb expression, then finally when the penny dropped was told "oh, the tuna ones? Oh, we only get one or 2 of those and they go in the morning." Hope they remain a success and I get a chance to buy some. It'll be a real treat to be able to buy sandwiches when I'm out and about. I might even stop carrying around emergency food rations wherever I go! Why hello lovely piggies in flakey, buttery pastry! It's been, hm, how long? Let's not talk about it, let's just enjoy our time together now! But seriously, they are yummy. Much nicer than the Steak Pies which, although flavoursome, are quite dry. I was invited out to All Star Lanes last Friday for bowling followed by a meal. After first panicking about the bowling, I started to panick about what I'd actually be able to eat. The food is famous for being American diner inspired so I wasn't holding out much hope for anything other than steak or salad. I fired off an email to the customer services address on the website and they responded with a handy allergy guide to the menu. (Really not sure why they couldn't just put this on the menu itself). I noticed the other day that the guys at Look What We Found! recommend using Musk's sausages for their recipes.I hadn't heard of them before so quickly did a Google search and found their website. "Our famous secret recipe with a twist! 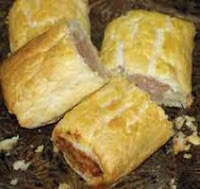 We have removed the bread and substituted rice which, together with our best British pork shoulder meat, make this award winning sausage. Ideal for those with a gluten intolerance; they retain the succulence and flavour of our original sausage. All our varieties have received recognition from the Guild of Fine Food Retailers by being awarded their Gold Award.Ingredients: Pork (75%), Rice, Water, Spices, Salt, Natural Casings. Preservative: Sodium Sulphite. Allergy advice: Contains Sulphur Dioxide. "They can be purchased at Eric Tennant butchers in the Rookery, Newmarket or you can contact them via office@musks.com for details on your local stockists. Found this on the Sainsbury's website - how exciting! "With over 100 new and improved products, our new range of freefrom products is bigger and better than ever. Our new extensive range of gluten, wheat and dairy-free foods means that you don’t have to compromise on quality, choice or taste.Save money nowStock up and save with50% offa selection of new and improved freefrom products, like our caramelised onion rolls, sticky toffee pudding and Italian corn penne and many more...Get25% offMrs Crimble’s entire range of delicious wheat-free, gluten-free, and dairy-free products.Hurry these offers end 23 March 2010!" Check out the web page. You can see a full list of all Sainsbury's products not containing wheat here. How cool is that? Yesterday I blogged about the Crossed Grain symbol. One of the few places you'll find it used is here. Look What We Found! make dishes, sauces and soups out of seasonal, fresh ingredients then vaccuum pack them so they can be sent via mail to your home. Many of their foods are naturally gluten free but you'll find their range of certified gluten free foods on their website. Gluten Free curry sauce, beef chili con carne, bolognese, beef and basil meatballs in tomato sauce, Cumbrian lamb hotpot, Moroccan spiced chickpea tagine and lots more. They also do taster packs so you can try a range of their most popular products. I sent an email to the people at LWWF to check they didn't mind about me blogging about them. I got a very lovely reply giving me and you the readers the permission to use a special discount code to receive a 10% discount on all items purchased on the site. I spotted the crossed grain symbol on a website yesterday (see blog about said company tomorrow) and it made me realise that it's quite rare to see the symbol and wonder what the criteria are to use it. I found the answer on the Coeliac UK website. It indicates "when a food has less than 20 parts per million (ppm) of gluten so it is safe for people with coeliac disease to eat." They "registered the Crossed Grain symbol as a trademark across Europe and also own the worldwide copyright. The symbol can only be used under licence by companies and organisations on food and drink products which meet (their) criteria, and in certain publications after approval." There is a charge to use the symbol but I hope that doesn't put anyone off, I'd love to see it used more often. For more information on food labelling for Coeliacs see this page on the Coeliac UK website.